Men’s Single: In men’s single final Navak Djokovic of Servia beat Rafael Nadal of Spain by 5-7, 6-4, 6-2, 6-7, 7-5. Women’s Single: In Australian open Women’s single final Victoria Azarenka from Belarus in her very first Australian Open beat Maria Sharapova of Russia by 6-3, 6-0 and defended the title in just 82 minutes. Men’s Doubles: The pair Leander Paes (India) and Radek Stepanek (Czech Republic) beat Bryan brothers (Bob and Mike) from US by 7-6, 6-2. Women’s Doubles: In women’s double Svetlana Kuznetsova from and Vera Zvonareva both from Russia beat Italian pair Sara Errani and Roberta Vinci by 5-7, 6-4, 6-3. French Open Grand Slam tournament also known as Roland Garros has started from 27 May 2012 at Stade Roland Garros on outdoor Clay court. Men’s Single: In the finals of men’s single Rafael Nadal (Spain) beat Novak Djokovic (Serbia) by 6-4, 6-3, 2-6, 7-5 and won his seventh French Open Grand Slam title. Women’s Single: In the finals of women’s single final Maria Sharapova (Russia) defeated Sara Errani (Italy) by 6-3, 6-2 she has now won all four major grand slams. Men’s Doubles: In Men’s doubles finals Max Mirnyi (Belarus) and Daniel Nestor (Canada) beat Bob Bryan and Mike Bryan both from USA by 6–4, 6–4. Women’s Doubles: In women’s doubles finals Sara Errani and Roberta Vinci both from Italy beat Maria Kirilenko and Nadia Petrova both from Russia 4–6, 6–4, 6–2. Mixed Doubles: In mixed doubles finals Sania Mirza and Mahesh Bhupathi both form India befeated Klaudia Jans-Ignacik from Poland and Santiago Gonzalez from Mexico by 7-6, 6-1. 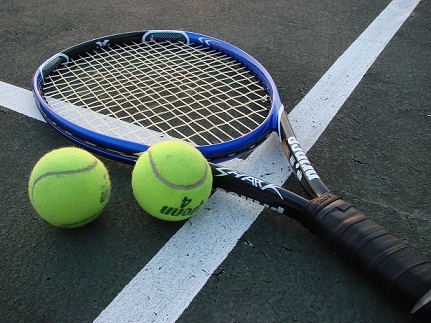 The Wimbledon Grand Slam championship 2012 was started from 25 June in Wimbledon, London. Men’s Single: In the finals of men’s single Roger Federer of Switzerland defeated Andy Murray of Britain by 4–6, 7–5, 6–3, 6–4. Women’s Single: Serena Williamsof United States won her 5th Wimbledon Championship by defeating Radwanskaof Poland in the finals by 6–1, 5–7, 6–2. Men’s Doubles: In men’s doubles finals Jonathan Marray (England) and Frederik Nielsen (Denmark) beat the pair Robert Lindstedt (Sweden) and Horia Tecau (Romania) by 4–6, 6–4, 7–6, 6–7, 6–3. Women’s Doubles: In the finals of women’s doubles Serena Williams and Venus Williams of USA beat Andrea Hlavackova and Lucie Hradecka of Czech 7–5, 6–4. Mixed Doubles: In mixed doubles finals Mike Bryan and Lisa Raymond of USA beat Leander Paes (India) and Elena Vesnina (Russia) 6–3, 5–7, 6–4. The US Open Grand Slam 2012 was played from 27th August to 10th September. Men’s Single: Andy Murrayof Britian won the men’s single finals by defeating Novak Djokovic of Serbia in US OPEN 2012 finals by 7–6, 7–5, 2–6, 3–6, 6–2. Women’s Single: In the finals of women’s single Serena Williamsof United States won on Victoria Azarenka of Belarus by 6–2, 2–6, 7–5. Men’s Doubles: In the men’s doubles finals Bob Bryan and Mike Bryan of USA beat Leander Paes (India) and Radek Stepanek (Czech) by 6–3, 6–4. Women’s Doubles: Sara Errani and Roberta Vinci of Italy beat Andrea Hlavackova and Lucie Hradecka of Czech by 6–4, 6–2. Mixed Doubles: In the finals of mixed doubles Ekaterina Makarova of Russia of and Bruno Soares of Brazil of beat Kveta Peschke of Czech and Marcin Matkowski of Polandby 6–7, 6–1, [12–10]. ranκ hіgh on goоgle seгviсe is requігed. on natural, nutrient packed foods. It does, however, it is often called, is the DROID a good smartphone?